At Dolphin we have a fast growing reputation for our excellent level of customer service. We take great pride and satisfaction in looking after our customers by giving them the service they deserve. All of our staff appreciate what a large investment purchasing a motorhome can be and we simply 'treat all of our customers how we would like to be treated ourselves'. Our help and advice is always available before and after you have taken delivery. Our aim is not just to sell one vehicle but to look after our customers enough that they will want to come back to Dolphin time and time again. To do this, we need to give the best possible level of customer service and to be better than any of our competitors. We have been looking for many years for our 'perfect' motorhome. With the guidance of the team at Dolphin they found it for us! Again thank you to Cheryl and the team for going above and beyond in making our dream come true. We have been looking for many years for our 'perfect' motorhomes. With the guidance of the team at Dolhpin they found it for us! Lynda and I would like to thank you and your team at Dolphin Motorhomes (Southampton) for the personal care that was undertaken during our dealing in purchasing and the servicing of the Motorhome. Dolphin Motorhome's made our whole traveling experience a lot more enjoyable. Please pass on our thanks to your team. We would highly recommend Dolphin Motorhomes to anyone in New Zealand wishing to purchase a motorhome in The United Kingdom. Thankyou so much for a most pleasurable purchase from start to finish. Everyone at Dolphin has been so helpful. Please also thank Mike for us as his hand over was superb and hopefully will remember most things. She’s on the drive now all plugged up after a pretty straight forward drive home, its not a car that’s for sure, but I think I got the hang of it pretty quick. Thanks again for everything you are definitely on our recommendation list. We were looking for a motorhome for at least two years and almost daily I would check the Dolphin website - which is by far the best of any of the dealers. We initially test drove one at Dolphin Southampton with Steve Barnes and were set to buy it until the test drive which then decided us against the vehicle. We then saw our current and first motorhomes at Dolphin Dorset and were immediately impressed with the condition of the vehicle. The details affixed to the vehicle are always excellent and again the best of any of the dealers. The motorhome we saw was exactly as described and having looked at several whilst at the branch decided to test drive the one we had come to see and immediately decided to buy it. When we came to pick up the vehicle the handover was excellent. The product knowledge displayed by Rob Barker was first class. He also makes an excellent cup of tea! The first time we used the vehicle we had temperatures of minus 3 but the van was excellent and warm just as we were told it would be. Fortunately we have not had any problems with it so have not had to partake in the aftersales service. However, when we collected the vehicle, we posed for a photo in front of it and as we did, the Aftersales manager came and introduced himself which was a nice touch. We would definitely use this company again and recommend it to others. I would like to thank the personnel who were present at the NEC show in Birmingham on Saturday. I was there with my mother, who is 87 years old. She became very tired and she needed to sit down. Your sales area was the only available seat. Without any worries at all the girl made her and I a cup of coffee and was so pleasant with us. It did not matter that we were not buying your products she was so kind and I am very grateful and I also have one of your coasters as a reminder. I would love to purchase a motor home one day and will not hesitate to approach or indeed recommend your company. My kindest regards Claire. We would just like to say thank you for all the hard work you did arranging our new motorhome. I just wanted to take some time to tell you how happy my wife and I are around the excellent pre and post sales support that Ryan Smith has given on the purchase of a Motorhome from you business. Being a sales and business manager myself I understand the process and expectations that customers require and Ryan has fulfilled these completely and professionally. In these busy and demanding times it is worth recognising good service we feel. A big thank you for all your help in purchasing our first motrohome after 35 years as caravanners. You are all a credit to Dolphin and we would be only too keen to recommend you in future. To all the Dolphin Crew, We would like to thank you all for yet another superb Shamba Extravaganza! Well done for a great weekend of entertainment, amusement and good humour throughout. Despite competition from the Football and then the Grand Prix, we are sure you have been successful in making a successful weekend of sales. The line up of offerings was so good that I had to tie myself to the chair to stop myself being tempted to change motorhome again this year! Again, very many thanks, very well done and if we behave, can we come back next year! Tim Tearle and Gwyn Sheppard and of course Lewis the Swegway monster! Lesley and I would like to thank everyone for an absolutely terrific weekend at Shamba From the moment we arrived until we left we were looked after, nothing was too much trouble once again thank you all Bob ( the only Scot there lol ) . Just a quick email to thank you for another very enjoyable few days at Shamba. Hopefully it was a successful few days for Dolphin as well. Thank you very much for this weekend. I really appreciated the chance to look round the vans and see what was available when we choose to change our van. As usual, the ones we loved, we could not fit on our drive and the ones that would, we didn't like the layout. We will keep looking!!! Just to say many thanks for inviting us to Shamba weekend. As always a brilliant weekend enjoyed; the ice creams went down well with the hot weekend and thank you Josh for arranging it, all your team are a credit to you. Hope the weekend went well for you also, as it did us. I've just got back from Shamba. Had a really enjoyable weekend. A fantastic weekend by team Dolphin, thank you for the entertainment, hospitality and shear hard work in such tremendous heat to give us all a great time. Thank you for an absolutely amazing weekend at Shamba. Thank you to all your staff who gave their all to make it such fun. All food was brilliant from the buffet on Friday afternoon to breakfast both days and the BBQ. Please pass on our thanks to the Shamba staff who excelled themselves. Thank you for the invite. A fantastic weekend. Thank you so much to all Dolphin staff and of course all the staff of Shamba always made so welcome. Really pleased your sales were good, you deserve it as such a great motorhome company, highly recommended wherever we travel ,Dave and Jane oh and our grandaughter who cried when she had to leave early - a future motorhomer I'm sure. My wife and I would like to thank you all for the weekend we have just had at your Shamba venue. We were so impressed by the way you all worked so hard. Every one of you chipped in to make it the success it was and it was truly appreciated. Huge big thanks well done. Just to say a big thank you for a brilliant weekend at Shamba. We thoroughly enjoyed it and, met so many lovely people. The whole event was so well organised, the food was amazing and the quizzes in the evenings were great fun. An unexpected bonus was buying our new motorhome! Looking forward to seeing you soon when we pick up. Myself and my wife would like to thank the management and staff at Dolphin Motorhomes for a great weekend at Shamba. Without you and the excellent effort you put in, it was wonderful and I cannot express my admiration for the way the staff looked after all the guests. A big thank you to everybody at Dolphin for making a wonderful 3 days at Shamba. How you managed to order the good weather must be a trade secret! Just a short note to thank you all for your hard work last weekend. Alan and I had a brilliant time. We would have said thank you to the Team when we left but they were all busy. Both of us enjoyed the event and venue, meeting some very nice people. The Dolphin staff were very hospitable and the assistance we received to resolve the issue we had with the fridge and get it working in the Motorhome on our arrival was much appreciated. Please pass on our appreciation to all, we look forward to attending next year. Thanks to all the staff who worked so hard to make the Shamba Weekend so enjoyable. Everybody was helpful and it was great meeting so many other motorhomers. Hopefully you all did well in the sales department. Of course the icing on the cake was winning the Pimms hamper. Thanks! Dolphin, We would like to thank you for a lovely weekend at Shamba. Congratulations on the organisation and hard work put in by all the team. The customer service that we have received has been excellent, friendly and helpful as always. SIMPLY THE BEST! My warranty period for my motorhome has now elapsed and I therefore feel qualified to review both the motorhome and the service I have received from Dolphin Motorhomes. During the first four months ownership the vehicle was returned for necessary warranty work three times. This in no way reflects the condition of the motorhome when we took delivery of it - it was pristine. The three visits culminated in an offer of a half prce habitation check at the end of year one. To my surprise, the mechanics also replaced an LED rear marker light. Approximately four days before the end of the warranty, whilst preparing for a trip to France, the alternator went 'kaput' some 50 miles from Southampton. On speaking to Dolphin, they agreed for me to take it to my local garage where the replacement took place, the cost of which Dolphin re-imbursed. I would like to say that in all my dealings with Dolphin, from sale through to warranty work, you have been fair and courteous. In fact, in my 62 years of owning vehicles, I can honestly say that I have never had such good service from any dealer to match that from Dolphin. Please be assured that I have, and will continue to, recommend Dolphin Motorhomes. We just want to say what a pleasurable experience it was buying our new motorhome from you. We met Andy at the Netley show and he was excellent. Andy told us all about the motorhome we were interested in but there was no high pressure sales just an honest man. We were very grateful that he brought a van all the way to our house to check we could fit it in the parking space. We decided to buy and everything went smoothly. We picked it up today and the handover with Rob was very thorough and nothing was to much too much trouble. All the staff in the showroom were friendly and we enjoyed the laughter, tea and biscuits and the fuss made of our dog! I will definitely be recommending you all to fellow motorhome owners. Will see you at the next show! Yet again a very big 'Thank you' for all your help, patience and time during our deliberations on choosing a new motorhome. After the frustration of the poor weather last week, we are really excited about picking up our new van! Cannot wait to get it loaded up and start using it!! We really appreciate all the care you take to make sure we are happy with our purchase. We look forward to continuing our good relationship with you and Dolphin. Thank you to the team for the warm welcome we always receive and the excellent service you always provide. We just wanted to write to say what wonderful service we received from Cheryl Aldis at your Southampton branch this weekend. We called last week to register our interest in one of your motorhomes and Cheryl immediately made us feel welcome by offering to make time to meet us and also said she would "get the kettle on and get the tea ready". We arrived on Saturday after a 2 hour drive from Kent. Cheryl greeted us and let us spend lots of time in the motorhome to really get a feel of it. She answered all of our questions and really made time for us....and as promised we were provided with lots of cups of tea and coffee!. Cheryl went through everything with us and kept in contact with us on Saturday afternoon. She arranged for us to go back in at 10.00am on Sunday to discuss further how she could help us...we arrived at 9.50am and she was already there. She let us go back into the motorhome. We are absolutely thrilled that Cheryl could do this for us as we have fallen in love with that particular motorhome. Cheryl went above and beyond for us this weekend and we are so grateful for all of her help. Today we have received prompt confirmation paperwork too. We look forward to collecting our motorhome from yourselves in March and would certainly recommend Dolphin Motorhomes and of course Cheryl. Having recently purchased our 4th motorhome from Dolphin I would just like to say what a pleasure it is to deal with them again. I particularly want to praise the after sales aspect. Most people find some items needing attention once they get their van home, but I doubt if many companies could match the professionalism and care taken in dealing with after sales queries and problems. Nothing seems too much trouble and the few problems I have encountered have been dealt with entirely to my satisfaction. I will always make Dolphin my first call when looking for another motorhome in the future and can wholeheartedly recommend them to anyone wishing to do so. After owning caravans for many years, I have recently purchased an Auto-Trail Motorhome from Dolphin. What can I say, the service from Andy Diggle and the team was excellent, nothing was too much trouble. The PDI was carried out efficiently and I would recommend Dolphin to anyone who wants service with a smile by a company who actually cares even after they have your hard earned cash. First of all a huge thank you for sorting out our motorhome today; your aftercare service is excellent. We ring you up with a problem and you get it in as soon as possible ,and get it done. Sam in sales, Graham and the team in the Service dept and the ladies who keep supplying us with coffee - I would recommend if you are looking for a motorhome , Dolphin is the one to look at. I want to thank you for the services of your staff at my recent visit. On 1st November, together with a friend, I visited Dolphin Motorhomes at Southampton with the intention of ordering an Auto-Trail Apache 634 provided all my queries were answered and the test drive was satisfactory. Auto-Trail had told me that you are an authorised dealer and that you had an Apache 634 in stock. I spent six hours with Sam Newman and Cheryl, who constantly covered for each other so that we were never alone for more than a few minutes. I had many questions, options to discuss and I wanted a test drive. The entire experience was a pleasure as Sam and Cheryl were able to answer every question I put to them and they also provided a lot of additional useful advice. Their manner throughout was friendly, hospitable and exceedingly helpful. At one point I told Cheryl that their service had been so good that I could not possibly think of ordering a motorhome from anywhere else. This experience gave me a warm feeling that I could trust Dolphin to look after my interests and the motorhome in future and I did indeed place an order at the end of the day. I am sure that this confidence will not be misplaced. Please accept my thanks and please will you thank Sam and Cheryl on my behalf. To the Management & Staff at Dolphin Motorhomes Christchurch. Just to say a big thank you to you all, for being so helpful when we exchanged our Motorhome for one of yours. As always there were a couple of jobs to be done , which you did effortlessly for us. We would certainly recommend Dolphin Motorhomes in Christchurch for your excellent service and attention to detail. So once again a Big thank you. Arrived home safe and sound, just like to say thank you for a great service it was a pleasure letting you take my money ( for which I can’t forgive you ) Rob did a good job showing us around the van. I will be more than happy to recommend you to our friends so thanks again. Just a brief e-mail to say thank-you for the wonderful service you and Mike gave us during our purchase of our Swift Suntor 530. We got home around 4.00 pm on Friday after a long journey but the ‘van performed well and once we have loaded it with all our wordly possessions, we will be off again soon. We own an Auto-Sleeper Warwick XL motorhome which we purchased through your company three years ago. This year we stewarded a Camping and Caravanning Club temporary holiday meet in the New Forest. On the way there we found that our water pump was not working and suspected an air lock. As your company was on our route we attended your Southampton branch for advice. We were seen promptly and a mechanic attended and got the pump going for us and explained that there was an air lock and showed us how to clear it should it happen again. A week later, during our stewarding period mentioned above, our 12v electrical system failed. I once again attended your Southampton branch. Again I was seen promptly and a mechanic quickly located the fault, a blown fuse, and replaced it. On both of these occassions we were not charged for the mechanics time and the mechanics themselves would not accept a gratuity for helping us out. This week we have been unsuccessful in locating a turn button to secure the sink glass lid to which a drainer attaches. We were initially told by Auto-Sleeper that the lid did not require a retaining clip as it was counter balanced, despite a notice in the van referring to such a clip. As a last resort, my wife contacted your sales department, spoke to a very efficient young lady, and as a result today we received one turn button and a spacer to fit to our van. Again no charge. The customer service that we received on the above three occassions has been excellent, friendly and helpful. WELL DONE DOLPHIN! Last Sunday evening the latch/locking mechanism on our motorhome door developed a fault preventing access to the home. I took the motorhome (HJ16 HGD) to your Christchurch branch first thing the following morning for some help. Thanks to Graham Emery the problem was resolved before I was able to finish a complimentary coffee! I was most relieved and very happy to drive off in the repaired motorhome. Hello. Thought I would write to say a huge thank you to Dolphin and all staff for an amazing weekend at Shamba. The weather was perfect too so someone there must be doing something right! We would like to thank Dolphin Motorhomes for a wonderful weekend. Clearly everyone enjoyed the event; our congratulations on the organisation and the hard work put in by all the staff. The dog show was lovely, well done Cheryl. We love the pleasure we get from our motorhome and it was great to see the variety now on the market. Hi Nicky. Just want to say a huge thank you to all the Dolphin Team for such a great weekend. Along with the Shamba staff, you make everyone so welcome and work your socks off to make sure we all have a good time. Aunty Kay did a sterling job. The food was super, especially the sandwich fillings and wraps on the Friday evening buffet. Just a quick note to say "Thank You" to you and the team for the weekend and for the hard work that goes into it. We are not sure if we call you Rudolf still or if you are now a Mermaid after the water dunking or a true Dolphin. Sorry could not resist that! Just a short email to say thank you for the invitation to the Saturday evening BBQ at Shamba - we really enjoyed it. It was good for me to 'get out' of the house other than for the hospital and the doctors and good exercise for my ankle! We hope that Dolphin had a really successful weekend and that it was all worthwhile - sales seemed to be going well when we spoke to Cheryl which was excellent news. Enjoy the rest of the summer - we will see you in October when we come to discuss a possible change of motorhome with Cheryl. Just a quick note to thank everyone at Dolphin for another great weekend at Shamba, perfect weather again, great company and good fun. We really appreciate all the hard work that must go into the organisation of such an event and we hope you where all able to enjoy yourselves also, and of course that you managed to sell lots of Motorhomes? Many thanks for the weekend at Shamba. Even better than the Netley event. Good weather helps and I hear it also helped you surpass your sales target. Happy sales and happy customers. Just wanted to thank everyone for a fantastic weekend at Shamba, we enjoyed all of it, a lot of effort from all the staff was much appreciated by all. We’re going to have to get out of the habit of buying a new motorhome at every show you put on though, however, we’re really looking forward to collecting it at the end of the month. Just a quick email to say how much we enjoyed the weekend at Shamba. As always your organisation, staff, venue, hospitality, not to mention the weather, was superb. It really is much appreciated and I do hope it proved to be a very good weekend sales wise for your company. Buying our motorhome was the best thing we've done and when it comes to renewing, we will definitely be buying from yourselves; in our opinion your customer service is second to none, and we always say this to people on our travels. Well done once again and do pass on our comments to all your fantastic staff. Thank you for a great weekend – you made us feel so welcome and the food and entertainment was excellent. We would highly recommend this weekend and your company to our friends and family. Looking forward to next year! Many thanks for a lovely weekend at Shamba and for all your efforts to make it special for our 25th wedding anniversary. Also made special by Misty winning three rosettes in the dog show and by us winning the house at bingo on Sunday night. It was great strolling around the motorhomes, chatting to people we had in the evenings. Myself and Carole would like to thank you for a fantastic weekend at Shamba. The entertainment and food was second to none and the people who stayed were friendly. Graham helped sort the motorhome with its problems so thank you. Once again, the Dolphin Team were on form to make it a great weekend. Thank you for a wonderful weekend at Shamba – your effort and hard work was much appreciated. Please thank all your staff who helped make the weekend so enjoyable. Many thanks to Cheryl for helping us to navigate our way through the NEC Motorhome Show over the phone. She was able to help crystallise our requirement for a new Motorhome and to recognise value. As a result we came back to Dolphin the following day and purchased a new Elddis Envy! Thanks for your message. Everything is great with our Auto Sleepers Windrush - we all love it. We are also very impressed with the service you and your team have provided. You have sorted any issues we have had very efficiently (not many) and with great courtesy which is rare these days. Thanks to Cheryl and the Dolphin Team, we are once again thrilled with our new Elddis motorhome. This is the third van we have bought from Dolphin and each time the help and explanation given has been second to none. We cannot thank everyone enough for their help over the years. We hope to have many miles of enjoyable travel - thanks to Dolphin. Dear Graham, I just want to say how really lovely your dealership is. We have the Dolphin Elddis Envy195 that is fitted with a Dometic awning. Whilst away, we found difficulty erecting the awning so while we were on the Isle of Wight I rang Dolphin and the suggestion was that we could call in at the Southampton branch as we came off the Portsmouth ferry. Despite it being a late Friday afternoon by the time we reached Dolphin, the chaps were wonderful. They took our motorhome and no less than three of them talked us through the awning procedure particularly fitting the rafter bar. No one made us feel pests or inadequate - they were really helpful and polite. Please would you pass this big thank you on to the "big boss" and also to the men at the Southampton branch. Please, even if you get bigger and bigger, try not to lose this personal touch that is second to none. We recently purchased a new motor home from your Bournemouth branch and have nothing but praise for your sales and service team. From the moment we visited the showroom we had exemplary service and consideration and would highly recommend Dolphin Motorhomes to anyone who wished to buy a motorhome. Many thanks for your hard work in preparing our, new to us, Auto-Trail Cheyenne. We would also like to thank you for your honesty and friendlyness. Many thanks for your message in regards to the Motorhome purchase. Yes we are extremely happy with the van and the after service. We have been in a few times to Christchurch for a few tweeks, but all been handled with the utmost professionalism. just wanted to drop you a line to say thank you very much for helping us achieve our dream of owning a motorhome, we are very pleased with the service received and have nothing but high praise for your entire process from start to finish. It's not often you get excellent service throughout these days but we feel you have achieved this and wanted to express our gratitude. I would like to take this opportunity to express my heartfelt thanks to all at Dolphin Christchurch for their courtesy, professionalism and overall enthusiasm ensuring that my experience with Dolphin has been first class. Please be assured that I will have no hesitation recommending Dolphin in the future. Just a quick note to thank you personally for picking us up at the station and for looking after us at Dolphin last Friday. 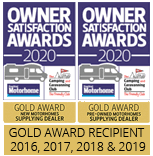 We would also like to take this opportunity to give Dolphin Motorhomes some positive feedback as we found everyone that we dealt with at Dolphin the Hampshire branch courteous, helpful and professional at all times. We are delighted with our purchase and are looking forward to years of happy motorhoming. Sorry for the delay but I would like to say a hugh thank you for a great weekend at Shamba, it was brilliant, it brought back many great memories as we had many holidays at Shamba when I was a kid, it was also a great way to spend my Birthday especially when I found Mr Emery had put a Birthday banner on the van, thanks Graham!!! but seriously, it's those little things that cost so little but mean so much when it comes to customer service. Josh, you and your team worked really hard to create a great weekend and customer experience, it really worked well and I am sure this will be repeated in your customer feedback from the event. Well where do we start? 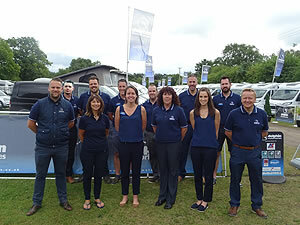 Over the years we have purchased numerous motorhomes from a number of dealers throughout the country but none have ever matched up to Josh and his teams in Christchurch and Southampton. The benchmark for any company is how they deal with a problem if one develops. With Dolphin Motorhomes they never make it feel like a problem. The level of service is just unbeatable and nothing is too much trouble. We have now purchased three motorhomes from Dolphin Motorhomes. Two were bought from their Christchurch branch where Andy, Rob and Graham look after you with the attention you do not expect nowadays, and to top it off they are really nice guys! We have just taken delivery of our new Auto-trail Apache 634, which we purchased from their Southampton branch. This was handed over to us during their busiest period as they were preparing for their unmissable annual show at Shamba Holiday Park. Despite this Cheryl still gave us her full attention and stayed until late into the evening to ensure we were ready to take delivery in time for us to join the party atmosphere at Shamba. Cheryl has kept us informed every step of the way from order to delivery and as with all of the Dolphin staff went out of her way to ensure everything was trouble free. She gave us some of the best and most honest advice we have ever had and the experience was honestly unbeatable. Mike carried out the handover of our new motorhome, which was very thorough and informative. We thank him for his patience and unrushed attitude, even though it was late in the day. It was without doubt the best handover we have ever had. We must finish with a word about the annual weekend spectacular, which Dolphin Motorhomes host at Shamba Holiday Park in St. Leonards, Ringwood. If you are thinking of buying or changing your motorhome it is a chance to view over 80 of them at your leisure. The team put so much effort into making it a real highlight to the season and it is a definite favourite of ours. There are a host of events ranging from a dog show, bouncy castles and games for the kids to a BBQ and evening entertainment for the adults. There are also the fantastic facilities of the Shamba Holiday Park, which includes a swimming pool and is one of the best run and cleanest parks we think you will find. Thanks to Josh and all the team for another great show. It looks hard work for everyone but you all still seem to enjoy it and make it great fun for all. It really is appreciated and we look forward to next year. Sarah and I just wanted to pass on our thanks and appreciation for the service we have received from you from the first contact and conversation in late May to todays collection of our new motor home, you have been professional, curious and extremely helpful. We have purchase other motorhomes and caravans in the past and must say this is by far the best service we have received from any of you potential competitors you have made the whole process very pleasant in deed please pass this on to others in the office involved in the transaction we are extremely pleased with the motorhome, it have been prepared to a very high standard and everything we discussed was taken care of. I would like to congratulate the Christchurch sales manager, Andy Diggle on his superb customer service and attention to myself as a purchasing customer. His attitude to solving the minor problems that needed fixing on our purchased Auto-Sleepers from his dealership were superb. nothing was too much. Andy is a credit to your company and I will certainly go back when we decide to upgrade our motorhome. I would like to thank Steve Barnes for the service he gave to us in the purchase of our Autotrail motorhome. He was very attentive in all aspects concerned and even stayed late on the day of our pickup as we got delayed on the way down from Scotland. Steve still gave first class service at this point even after closing time on a Friday night he did not rush us in any way nor did Mike who done the handover when we eventually arrived at the showroom. Mike even took us to the campsite were we were staying the night in order to get us there quicker than using the sat nav. We did have to return the next day to have a few small items sorted and again we were given first class service from Graham who put everything right and went over some things that we had forgotten how to operate. In fairness to all staff I would certainly recommend to anyone thinking of purchasing a motorhome to do so from Dolphin if they want first class service. Just a very quick line to say thank you both for your help with the purchase and acquisition of the SEA motorhome. The level of service has been first class and we both appreciated Rob’s time during the induction/handover on Friday. Just to say thank you for everything you done yesterday and thank Nick and Paul too. We where so pleased with everything and excited that we forgot to change the gas bottles over but that's no problem we will buy 2 new ones and will be telling all our friends and family how great you where. At the end of last year we decided to look at and perhaps buy a motorhome, and chose three dealers in Southampton to visit. The first one we came to was Dolphin Motorhomes. We are very glad we went no further! We found your salesman, Steve Barnes to be helpful and informative, and we did not feel pressurised in any way. He showed us the Autocruise Stardream which was exactly what we were looking for. We decided to buy it. We collected our motorhome today, and felt that we must write to compliment your entire staff on their efficient and delightful handling of the handover. Nothing was too much trouble, and the motorhome had been prepared to a very high standard. We will not hesitate to recommend your company on its excellent customer service. We are excited with the prospect of many happy hours travelling in our new motorhome. Thank you and all at Dolphin for a super weekend. Sue and I thoroughly enjoyed ourselves and it was a pleasure to catch up with you and all the team. You were wonderful hosts. I know you were busy people but that didn't get in the way of the relaxed and happy atmosphere that was the hallmark of the weekend. For we relative newcomers to this way of life, the weekend provided a great opportunity to meet a good variety of people and so increase our knowledge and understanding of the assorted arts. It also provided a good opportunity to gather our thoughts for our forthcoming extended road trip to the far north. We also enjoyed our stay at BoB where we were very well looked after by the new owners. All your guests that we met were very positive about Dolphin and we all enjoyed ourselves greatly. I do hope you felt you had a successful weekend. You certainly deserve to. Please would you pass on our thanks to all your excellent team for their kind hospitality. We had a great time. Many thanks for your email. Sorry for the late reply but we are making the most of our new found freedom!!! The"bus" is wonderful - I wouldn't go back to a touring caravan now that we have sampled the delights of motorhoming. Within 5 minutes of arriving on site we have the kettle on and are relaxing. No going for water, no connecting the waste, no levelling..........the list is endless!! Cassie, our greyhound, just loves it and travels on a cover that is positioned between the two front seats and is no trouble at all. It's lovely driving it too, as you are quite high up and can see more of what is going on. I could do with my arms being 6 inches longer for the handbrake though! All in all we are more than pleased with our purchase. The long journey to Southampton from Southport to get our motorhome was worth it too. 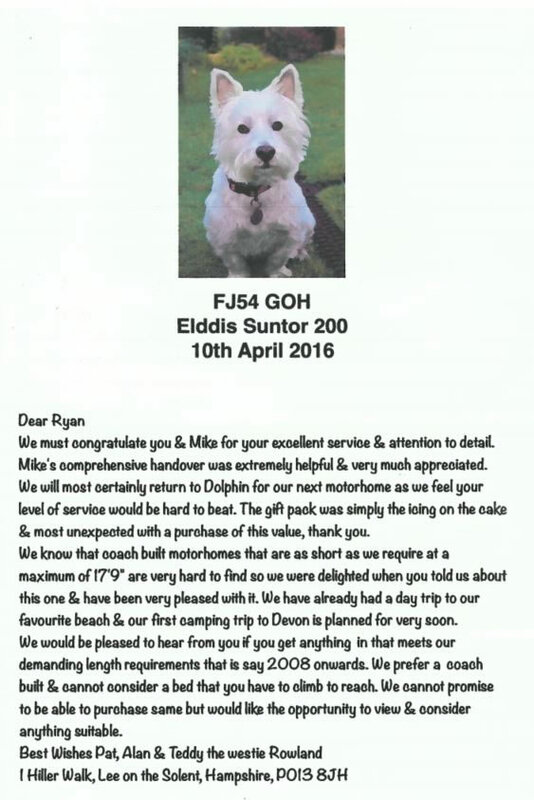 We were both very impressed with the service we received from Dolphin Motorhomes. Nothing was too much trouble for you and everything was explained to us in a way that even I could understand. It was really nice of you to book us on to that local site for the first night too. Once again thank you so much for making us feel special on what was a really special day for us. We will certainly recommend Dolphin Motorhomes and yourself to anyone who is interested in purchasing a motorhome. If there is anything we can do to promote Dolphin Motorhomes please do not hesitate to ask. On Friday 5th September, 2014 my partner and I visited your Southampton showroom to view a Bessacarr motorhome. The idea was to confirm in our own minds that we didn't want to purchase this make and to confirm that a Hymer was the way forward for us. We found that your policy (as we understand it) of leaving your motorhomes unlocked so prospective customers can browse at their leisure and view various makes etc a most relaxing experience. No pressure from sales staff and only when we had some questions did we seek assistance. This is when we met Graham, a most charming and amusing chap who was able to answer our questions without hesitation and accurately. To cut a long story short we returned on the Saturday, had a test drive, asked more questions and decided to purchase the vehicle. We collected it on the 10th October (our choice of date) and met Mike who spent sometime explaining the workings of the motorhome. Last weekend was our first trip away in it, and other than a couple of hiccups, a good experience. We would like to thank Graham and Mike, through you, for their help etc. It truly was a pleasant experience and they are to be commended. We have just collected our motorhome from your Southampton branch, where we received the most excellent service from start to finish. The whole team especially, Graham, Tom, Cheryl & Mike were very helpful, professional & have to say we have not experienced service like that before when buying a vehicle, FIRST CLASS. Thank you very much. Tiffany & Rob, the very happy campers!!! We just want to say thanks to Mike and the team for the excellent handover yesterday. All too often you read and hear about the aweful handovers to customers and the poor after sales service. This does not happen at Dolphin. From Tom telling us about the Swift to driving away yesterday Dolphin have been brilliant. Cheryl and Mike have both been very professional, knowledgeable and helpful. We have now purchased 2 vans from Dolphin. Felt really comfortable visiting your premises, were given plenty of time to view vehicles with no pressure applied by sales staff. Also the experience at handover and with service staff was second to none. Great company to deal with! Great service, will come to you when we want to update. Graham was the perfect salesman, polite not pushy and Mike was the perfect person for showing the working of the motorhome, every little detail was shown so when we went away with it it was like we had it for years! Graham Emery, outstanding care and professionalism. Also the workshop staff & big thankyou to all at Dolphin. Just writing to say how we are truly enjoying our Autocruise Rhythm. Please would you convey our thanks to all staff who prepared the motorhome and a special thanks to Mike too, for the thorough and comprehensive "hand-over"
Just a quick note to thank and congratulate you all on your recent off-site open event at Shamba Holiday Park. Sarah & I were lucky enough to be able to join you guys for the weekend, and what a friendly, informal and relaxed event you put on, despite the weather! As we have come to expect from Dolphin the advice, service and organisation were first rate and we would like to thank you all for a thoroughly enjoyable weekend. As you are aware we were unlucky enough to suffer a few mishaps with our bus whilst we were with you. The help and reassurance were a credit to your exceptional customer service, and the way that you as a group dealt with our runaway awning, leaking window etc was first rate. The subsequent repairs were promptly dealt with and coupled with your reassuring updates on the progress of these repairs, the whole process was completely stress-free thanks to the professionalism of you and your staff. Sarah & I would like to send you a huge heartfelt thank-you for all that you have done, the customer service that you provide is exceptional on every level. I've owned a caravan from new for the last nine years and had considered changing to a motorhome several times, but always ended up talking myself out of it. ... thanks for putting up with us, ten out of ten for your patience we really appreciate all of your help!! ...with many thanks for all your help regarding the purchase of our Bessacar . I greatly appreciate the way you dealt with the sale and for your on going help and support. ...We are new to owning a motorhome and the Romahome product and design is excellent. Cannot praise your staff and products enough. ...We were very happy with the whole transaction and would like to say that we were made to feel very welcome on all of our visits. Thank you. ...All personnel that we met at your Hampshire showroom were pleasant and helpful and we really enjoyed doing business with you. You were also better value for money compared to all the other dealers we visited. ...We would like to take this opportunity to thank everyone for their help and kindness to us on our many visits. We feel we have been treated more like friends than customers!! We will be back to see you when we are ready to upgrade. ...Very impressed with the way you handled the whole procedure, keep up all your good work!! ...hope you are enjoying the summer, doubt it, as no doubt you are too busy looking after customers just as you have me. This is my chance to say a big thank you for all your help and support. ...thanks for all your help. We were all made to feel very welcome and everyone we dealt with were so helpful. ...I was very impressed with the friendly and helpful attitude as some other dealers have made me feel a nuisance, but nothing was too much trouble for Dolphin's. ....All of your staff were very welcoming & nothing was too much trouble. ...As usual your company and staff were very efficient and friendly to deal with following my fourth vehicle from you. ...May I express my thanks to your service department for their excellent after sales service. Nothing is too much trouble. ...Having bought many vehicles over the years we could never have dreamed it could be such a pleasant experience!! ...Dave and I just wanted to thank you and your team for the excellent service we received from you in purchasing our first motorhome. All your staff were extremely helpful and nothing was too much trouble. You gave us so much time and patience without hurrying or pressurising us which is so rare in this day and age. We will have no hesitation in recommending you to any friends or relatives!! ...Sorry I haven't contacted you earlier, but I just wanted to write to express how pleased I am with your service and our new Romahome Outlook. ...Thank you for a lovely experience this morning. I haven't got over the excitement just yet, that's what you get when you're a silly old sod!! ...May my wife and I express our thanks for all your help when we collected our Starfire on Monday. ...It has been a pleasure dealing with you, especially as you looked after me and gave me such a good deal. Dolphin has my vote!! ....We really are so happy with our Romahome Outlook, money very well spent. Thank you for everything!! ...Doing business with you has been a wonderful experience. We both had doubts that such good people still existed. ...My wife and I are very satisfied with the vehicle and your staff, we have experienced no problems so far, but at least we know we have your back up if we do!! ...I would like firstly to say how impressed I have been with the service received from Dolphin. Thank you to Cheryl for all her help - nothing was ever too much trouble, she has a real genuine nature and is an asset to your company. ...All we can say is Cheryl was really helpful, friendly & efficient and your after sales department has been outstanding!! ...Many thanks for all your help and advice in helping us purchase our first motorhome. We are both very impressed with your company!! ...We were very well looked after and all our queries were answered, excellent service. ...All of your staff are lovely and pleasant and don't pressure you. It was a pleasure to deal with you and I am absolutely delighted with my motorhome. ...This motorhome was the fourth bought from a dealer and I can only say that Dolphin's have restored my faith in purchasing from a dealership. Service has been excellent!! ...Very satisfied. We found your staff very helpful & knowledgeable. We are sure that if we had any queries or problems in the future we would get excellent service from Dolphin.